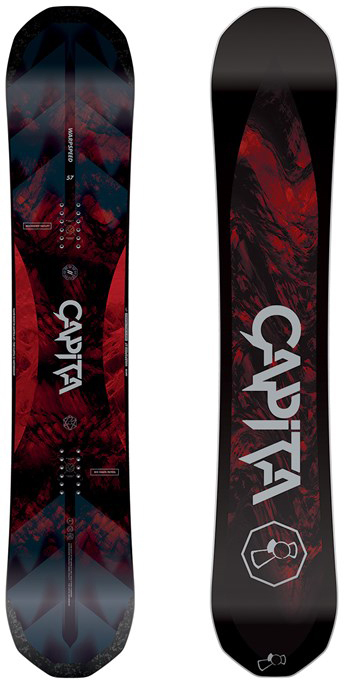 The Capita Warpspeed is a really fun mid/wide board that replaced the Supermacho. It sits in between the Black Snowboard of Death and The Mercury but it’s made for mid/wide to wide boot riders. It’s a great quick turning solution for those that don’t want toe/heel drag but also want a board to ride like a regular width board. This is a great one board quiver for everything except hard snow. The 2019 Capita Warpspeed seems to have a slightly different core, a small tweak to the top sheet, carbon reinforcement in the tip and a different base tune making it a little different than the board we reviewed in 2018. Still, the overall ride will be similar since it has the same specs and camber profile. Based on our recent experiences with Capita’s core/top sheet upgrades the Warpspeed should ride a little better than 2018. Conditions: Really good spring conditions to not so great spring conditions with pretty hard snow in the morning. Set Up: A little back but not all the way approx 22.75″ 15 front -9 back. Approximate Weight: Feels on the normal side of light but lighter than most boards it’s size/width. Flex: So Capita has been doing a lot the last few years when it comes to improving how their boards flex and the Capita Warpspeed is a prime example. It’s got a stiff aggressive feel between the bindings but then a somewhat playful tip/tail when it comes to buttering. The nose more so than the tail due to the rocker but the tail can still butter well. It’s got a smoother flex overall but with a really dynamic return after. Sizing: Not for my feet but great for that rider who is a size 11 or more. On Snow Feel: The Capita Warpspeed is a pretty interesting ride. It easily earns the aggressive mountain title but has a lot of freeride going on too. The nose and tail are the same width but the tail has a lot less volume and length compared to the nose to where it looks more like a Freeride board than the 2018 Capita BSOD. However, when you get it on snow you feel a bit of the twinish Mercury thing going on. Edge Hold: It does a great job in soft to medium snow but when you hit those hard patches you have to be careful and really dial out your commitment to the edge. I’d love to see death grip going on here similar to what the Mercury has. Turn Initiation: Ok so here is what I personally love about the Capita Warpspeed. It’s very fast edge to edge if you know how to turn and even for a size 9 boot. I’m not saying to buy this if you are under a size 11 US boot…..I’m just saying it’s quick edge to edge. There is no compromise in turning if you go wide with this. Turning Experience: The Capita Warpspeed is such a joy to turn. The flex of this board really comes into play here and it’s got a fun pop out of anything from short to wide radius turns. If you love to turn then you will love the Warpspeed. Carving: As long as the snow is medium to soft the Warpspeed really lays it out. I had more fun on this than the BSOD and Jimbo lit up with joy being able to carve with his size 11’s. I usually don’t have mid/wides like this 157 for him to ride. Skidded Turns: The Capita Warpseed is not for those that don’t know what they are doing. It’s got a lot of hybrid tweaks to the camber with rocker in the nose and flat in the tail but it still feels somewhat catchy. It’s more forgiving than a full camber ride for sure but it’s still not for those that rely on an out of control skid to get them back on their game. Speed: The base is fast and even un-waxed it just wants to accelerate. We both loved how it picks up speed. The board handles chatter very well and it’s the kind of board that likes to bomb. It’s not super ultra damp but it’s great how damp it is for the kind of flex it has. Uneven Terrain: The Capita Warpspeed can power through chunder and also weave in and out of bumps like a champ. It’s a great board for a weekend warrior that’s there till the lifts close. Powder: We didn’t’ get any powder going but you can see this will do really well. It’s got minimal volume in the tail that will act like it’s tapered in the deep deep. Then you add a big nose with lot’s of rocker after the front binding and a pretty good set back on board then you don’t necessarily need a dedicated powder board. You can get 3.5″ back on board when setting it as far back as you can and that’s on the better side of the All-Mountain spectrum. Switch: The Capita Warpspeed is far from perfect but it’s much more twinish on the effective edge than you would think. Pipe: If it had more edge hold it would be a pretty good directional pipe rider. Jumps: So much pop off the tail and it’s outstanding for directional air. However, it’s different tip/tail doesn’t make it very consistent when landing fakie. We try to get as many images of the Capita Warpspeed, but forgive us if they're not all there. I'm not one to take the time to write reviews but when you get on something like this, it deserves the response. Started riding this after my rock board took some major dings early season. I was a little reluctant to bring it out so early but glad I did. This thing is insane. Incredibly fast, carves like a dream, and kills it in powder. I'm 6'2" 180 lbs and bought a 61 (17/18). This board is incredible stable hitting drops into powder, and the slightly smaller tail makes stomping those drops a lot easier. The edge hold is crazy. Euro carve all you want on this or take it down some gnarly pow field hitting every drop on the way. Plows through the crud with ease. One thing to note; It does take a little more energy to get this thing to turn in tight trees. Not a huge deal but something to keep in mind if you're a smaller rider. Big guys will be stoked with this thing. I'm stoked. If you couldn't tell. 5/5 would buy again and again.